Support Unbound (a 501c3 nonprofit) and reach an influential, Halloween-loving audience! – Our audiences love Halloween and exciting live events! 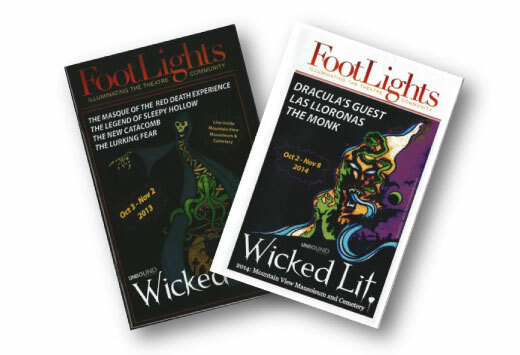 Wicked Lit is an immersive theatre event that is staged at Mountain View Mausoleum and Cemetery. This year’s production will include three plays (and a connecting “frame”) that are all adapted from classic horror literature. More than 22k patrons have attended Unbound Productions’ events since 2008.